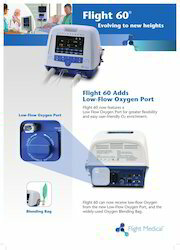 Pioneers in the industry, we offer portable ventilator from India. An intuitive 7" touch screen user interface allows for quick and easy access to all commonly used modes, as well as to all advanced options. Extensive alarms set position the Flight 60 at the highest safety level. New battery technology allows for up to 12 hours of autonomous operation, while Hot Swap capability grants the ventilator practically unlimited independence. Looking for Emergency and Portable Ventilator ?